Second-tier Democrat presidential hopeful Elizabeth Warren pow-wowed with 1,500 supporters, fans, and curiosity seekers in the Hangar at Stanley Marketplace last night with promises of confiscatory taxes, a “commitment to prosecute giant corporations and their leaders,” and policy decisions driven by her personal belief in climate change. She also repeatedly referred to the venue as Denver, when she was clearly in Aurora. Not a small mistake, as Aurora has more than 300,000 residents and is the 54th most populous city in America. 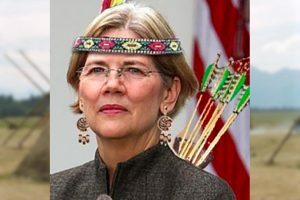 Of course, Warren has never been known for her honesty or attention to detail, as the most commonly-known fact about the candidate is that she spent a career lying about having American Indian heritage to gain favorable employment treatment throughout her legal and academic careers. Last night’s applause lines included the obligatory “Medicare for all” scheme buttressed with the nonsensical lie that it would provide healthcare for everyone at the lowest cost. Recycling, Amazon’s effective tax rate, and replacing Cory Gardner in the Senate next year were also crowd pleasers – not exactly the kind of inspirational stuff that captures the imagination of American voters and propels candidates to the White House. But let’s not kid ourselves here – no one really expects Warren to win the nomination for president. That honor will most likely go to the truly inspirational Democrat frontrunners: Joe Biden and Bernie Sanders. Warren’s Colorado stop comes around the same time as the state was visited by two other contenders, Sen. Amy Klobuchar and Colorado’s own John Hickenlooper. In an Emerson poll released yesterday, Warren registered seven percent support in a national sampling of Democrat primary voters. Hickenlooper and Klobuchar both polled less than one percent. Womp womp.